So, aaaaaages ago I signed up for a calligraphy course here on the island. Being left-handed, I was a bit apprehensive about how I would cope with learning the skills. However, I needn't have worried because it involved a lot of tracing beautiful calligraphic alphabets and I soon found a way to tilt my paper that allowed me to do the heavy and light strokes. The course left me with the desire to learn a copperplate script - and so off to Amazon I trotted to buy the correct paper. Up popped Calligraphy Guide Paper Notepad - 25 sheets (50 pages) of paper lined specifically for calligraphy. Brilliant! I signed up for two. Why yes, that IS Tom Hiddleston's head. The top line was written with a Noodler's Ahab (flex nib) with Caroube du Chypre ink. It looks ok with my naked eye - but my naked eye needs specs! With my jeweller's loupe I can see that it's feathering a bit. The line beneath was written with a Jinhao 992 with Diamine Oxblood and the feathering is less. Yes, my calligraphy skills are currently pretty dire. And yes, it should be 'practise' not 'practice'. Leaving that to one side and turning over the page, it's pretty disastrous. There is bleed through from the Noodler's Ahab that is so bad that it is actually is picked up on the sheet of paper behind. 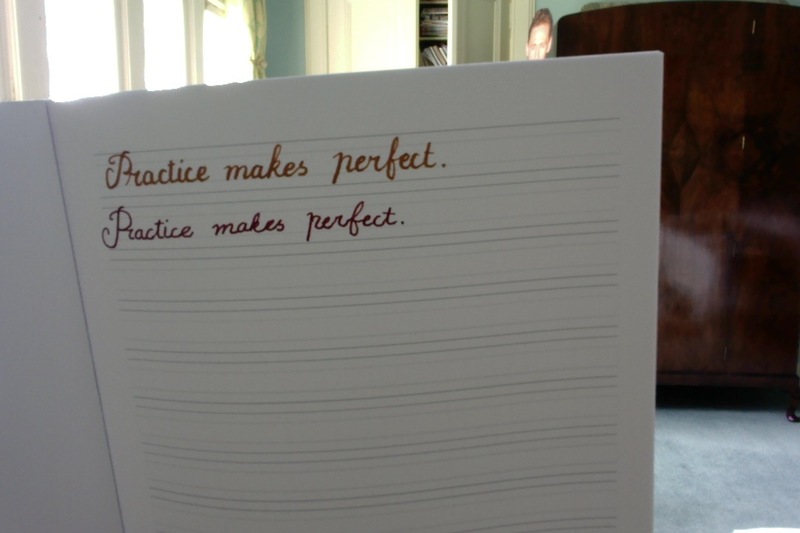 You simply could not write, even for practice/practise ... whatever... on the other side. The Jinhao bleed through isn't nearly so bad, so a finer nib and less pressing to get thick and thin clearly suits this paper better. Unfortunately, I would expect paper sold for calligraphy to be better-able to cope with a pen pressing heavily to get a broad down stroke. It would seem, from looking at the back of the jotter, that it is printed by Amazon in the UK. Overall - I'm disappointed that it's not up to the job. You would be much better buying this instead from Peter Pauper Press in the USA (via Amazon). I believe the Peter Pauper pad is printed in China.